Equally at home on the fortepiano and harpsichord, Rebecca Maurer is acclaimed as one of the outstanding specialists for historical keyboard instruments of her generation. She studied piano, harpsichord and fortepiano in Freiburg, Amsterdam and at Cornell University, USA, where she held a fellowship. fortepiano-continuo for Sir Roger Norrington’s recording of Joseph Haydn’s twelve London Symphonies with the Stuttgart Radio Symphony Orchestra (SWR). 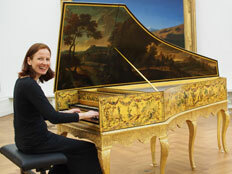 Ms. Maurer has also conducted master classes for harpsichord and fortepiano at leading music conservatories, including the Royal College of Music London and the University of Music and Performing Arts Vienna. In addition, she has served as a performance practice consultant for the new Bärenreiter Urtext edition of Joseph Haydn’s late piano sonatas. Ms. Maurer has presented collaborative lecture recitals on Joseph Haydn’s influence on British domestic music with musicologist Dr. Mekala Padmanabhan at New College (Oxford), the Haydn Society of North America, and the Beethoven-Haus Bonn. Rebecca Maurer’s debut CD Mozart und Beethoven auf der Reise nach Berlin and her world premiere recording of Antonio Valente’s Intavolatura de cimbalo have received excellent reviews internationally. In 2013 she was awarded a Cultural Endowment Prize by the Swiss hibou-Foundation. Rebecca Maurer’s latest recording, En sol – Musique pour le Roi-Soleil, was nominated for the Preis der Deutschen Schallplattenkritik as well as for an International Classical Music Award (ICMA) 2016 in the Baroque instrumental category.